One of the newer to me blogs I've been following, Better Life Bags , is hosting an amazing giveaway! She is giving away a $30 gift certificate to Yarrrn, a shop that makes hand-crocheted accessories. I'm not much of a fufu girl that needs all the cute lil pieces to coordinate my outfits, hence my blog name, but I DO love cute accessories that are practical and handmade! 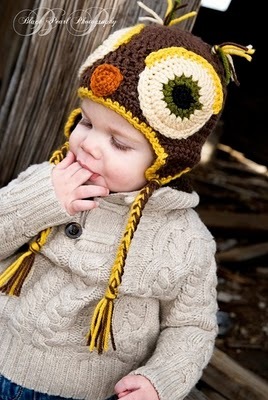 You have to admit the little owl hat shown here is pretty cute! Visit the Yarrrn Etsy Shop and see that they not only have cute, cute kids stuff but they also have fabulous goodies for us Mommy's! This giveaway ends Monday, January 24th so hurry and head on over to BLB to enter!